Henry Clay Folger was a man with a mission. 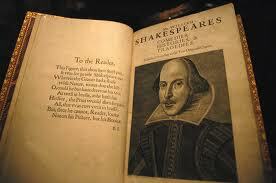 His goal was to obtain every possible copy of William Shakespeare’s venerated “First Folio” in existence. Folger began his obsessive quest in 1893 and over the next 35 years, he acquired 82 of the manuscripts. The most recent sale of a Folio in 2001 went for $6 million dollars, so the Folger Collection is one not only of great literary worth, but of considerable monetary value as well. With so few surviving Folios, perhaps it is not surprising that the manuscripts have been subjected to theft and intrigue. That compelling history is the subject of the Folger’s newest exhibit, Fame Fortune & Theft: The Shakespeare First Folio. The exhibit will include 10 of the manuscripts, and you may view one of them online here. The Folios are a big deal for several reasons. First, without the work of two of Shakespeare’s fellow actors, John Heminge and Henry Condell, there would be no extant copies of some of the most beloved of Shakespearean works, including Macbeth, Julius Caesar, As You Like It, The Winter’s Tale, and Twelfth Night. Heminge and Condell were exasperated by the false copies being circulated, cheap quatros that frequently did not even include the authors name, and told the public that they had been “abus’d with diverse stolne, and surreptitious copies, maimed, and deformed by the frauds and stealthes of injurious impostors.” They promised authentic manuscripts and collected them into an impressive 900 page volume. Another reason why the Folios are important is that they reveal the fact that William Shakespeare was a man of great stature at the time of his death. The Folios measure 8 1/2 x 13 3/8 inches, a size typically reserved for lectern Bibles and great works of literature. The forward is written by the esteemed playwright Ben Jonson: “Thou art a Monument, without a tombe,/And art alive still, while thy booke doth live.” The engraved portrait by Martin Droeshout is the reason we know what Shakespeare looked like. The Folger exhibition is not meant to delve into the literary merits of the works, however, but to uncover their past: how they changed hands, whether by legitimate sale or by theft, how copies became damaged, what prices they have fetched over the course of 400 years, and how they came to reside in the Folger and elsewhere. Some of the stories seem fit for a modern spy novel. For example, in 1940, a man working for a crime syndicate, posed as an English professor and gained access to a Folio housed at Williams College. On his first visit, he measured the Folio precisely. On his next visit, he brought a cut copy of Reynard the Fox in a slip-on binding. He exchanged Reynard for the Folio, and walked out. The FBI finally caught up with the man and retrieved the manuscript. How some of the copies became damaged is interesting as well. In one instance, the noted 19th-century American actor Edwin Forrest purchased one of the Folios and had a glass case built to house it. He bequeathed the manuscript to the Home for Decayed Actors in Philadelphia. A massive fire a few years later destroyed most of the pages, but a few of the survivors are now on display at the University of Philadelphia, and are still in Forrest’s specially-made glass case. The pages are considered too delicate to travel, so the Folger has re-created them for the exhibit. Finally, it is interesting to see how the value of the Folios has increased exponentially from “1800 to 195 purchases of the First Folio doubled every 50 years.” Additionally, it is not just England and the United States who own precious copies; so too do New Zealand, Australia, Africa, and Japan. “Fame, Fortune & Theft: The Shakespeare First Folio” runs through Sept. 3 at the Folger Shakespeare Library, 201 East Capitol Street S.E., Washington; (202) 544-7077, folger.edu.